On March 25th, 2015 the administrator of http://www.RightOfPublicity.com (Jonathan Faber) gave a live interview on Primetime with Henry Shinn. The show is on TBS eFM, 101.3MHz, and is an all English radio channel operating from Seoul, South Korea. The recent offering by HeroBuilders of an “Ebola Nurse” doll raises some interesting Right of Publicity implications. Putting aside any debate over tastefulness or appropriateness, the doll also resembles Kaci Hickox. Hickox is the nurse who has been in the headlines recently and who was quarantined in New Jersey against her will. The doll apparently is accompanied by an Ebola-free health certificate. Ty claimed the dolls were not of the President’s daughters, a transparent explanation considering the context of the use and totality of circumstances in which the dolls were offered. Ty claimed to have pulled the dolls off hte marketplace some time later, but not before their mission was accomplished. It could be interesting to see if HeroBuilders is working from the same playbook, and if any more comes of the Ebola Nurse doll. Actors, check your contracts! That seems to be the rally cry of 2011 as an increasing number of actors and actresses are bringing claims for the sale of merchandise relating to movie and TV show licensing. From the cast of Happy Days, the sheriff in The Dukes of Hazard, the bully in A Christmas Story, and even Princess Leia of Star Wars, the licensing and merchandising of these classic shows and movies have become fertile ground for lawsuits. Much of these disputes might be resolved by a careful reading, or judicial interpretation, of the actors’ contracts. As it pertains to Zack Ward’s claim against Warner Bros., he reportedly was originally contracted for a small part in A Christmas Story. When he was given the more prominent role of the bully, his contract was not adjusted or revised. According to 23 No. 8 Westlaw Journal Entertainment Industry 11, as well as the pleadings in the complaint, Ward was therefore the only major character from A Christmas Story who did not contractually give away the right to license his likeness as manifest in the Farkus character. In my experience, the contracts being written in recent years for actors’ and actresses’ services are much more specific, and typically address the types of issues that were overlooked decades ago. I believe this is due in part to a higher level of awareness of these issues in the legal profession (if not the acting profession), as well as the much more systematic licensing and merchandising campaigns that are built into TV shows and movies these days. I’m sorry to say it, Mrs. Fisher, but she very well may be. Cadbury advertisement, “Move over Naomi, there’s a new diva in town,” potential violation of Naomi Campbell’s Right of Publicity? 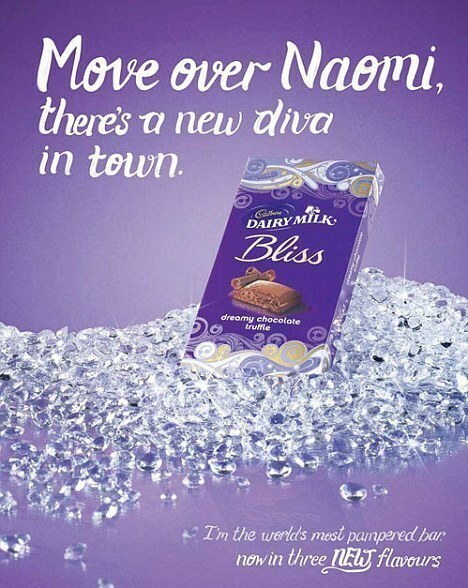 Cadbury is finding itself in a legal and PR mess after use of the line “Move over Naomi, there’s a new diva in town” in advertisements for Cadbury’s Bliss chocolate bar. Supermodel Naomi Campbell has stated that she will look at “every option available” including the possibility of filing a lawsuit, the Independent UK reports. This situation is interesting because it does not use an image of Naomi Cambell, or even her full name. Can use of just a first name trigger a Right of Publicity violation? It certainly can, if the association to Naomi Campbell is clear. I use the phrase “unequivocally identifiable” in my Right of Publicity classes, and this situation brings that phrase to task. Is a casual observer of the Cadbury advertisement going to think of Naomi Cambpell, even without further use of her image or full name? You be the judge. I invite you to post your thoughts. The context of the advertisement is part of the analysis. One can and must look at the supporting imagery, overtones of the ad, recent news, things the person in question might be known for, and similar elements that advertisers are very adept at incorporating into their creative. Oftentimes, these added elements are part of the timeliness, or punchline, or effectiveness of the advertisement. An observer of the advertisement is expected to arrive at the advertisement with these associations already in place. Interesting case of the tattoo artist asserting a copyright claim for the appearance of his infamous Mike Tyson-face tattoo appearing in Hangover II. It raises a slew of interesting intellectual property questions that I’m not going to research or try to answer definitively here. But in short, I see a number of problems with the tattoo artist’s position. I understand that no objection was made to the appearance of the tattoo in the first Hangover movie. Perhaps that is because only Mike Tyson appeared in the first Hangover movie, whereas in Hangover II, in addition to Mike Tyson appearing again, actor Ed Helms’ character gets a similar, or perhaps identical tattoo on his face. Maybe the argument from a copyright claimant in these circumstances is that the inclusion of his tattoo constitutes an unauthorized display in violation of his exclusive section 106 rights under the Copyright code. Similarly, perhaps the tattoo on Ed Helms’ character constitutes an unauthorized derivative work, or an unauthorized copying. If the activities complained of in Hangover II are copyright violations, then the appearance of the tattoo in the first Hangover movie must also have been a violation. The tattoo artist could hardly object to Mike Tyson appearing in a film, and by virtue of the tattoo appearing on Tyson’s face, well, the tattoo is going to appear as well. At this point, there could be a viable estoppel defense to the assertion of the claim now, years after the first Hangover movie. The notion of intellectual property in tattoo designs raises some novel questions. It is certainly possible to construct a scenario where a copyright, or trademark interests, can be manifest in a tattoo. If a person gets a Harley-Davidson logo tattoo, it is of a trademarked logo. If a person gets the lyrics to a song as a tattoo, it certainly could be of a copyrighted work. But what of a relatively simple configuration of angular lines, like the Tyson tattoo? Is that even an original work of authorship? Maybe. But who owns the copyright in the tattoo design? Might it be considered a work made for hire, vesting the rights in the recipient of the tattoo on whose skin it appears? Or, perhaps there is an implied license allowing the recipient of the tattoo to display the tattoo publicly. Certainly, when taking the conspicuous step of tattooing a person’s face, the tattoo artist cannot simultaneously expect to enforce the exclusive rights of a copyright owner concerning the right to display, reproduce or even perform the work. Can the tattoo artist/copyright owner then only selectively enforce his copyright? Doesn’t this lead to the scenario that anyone who takes Mike Tyson’s picture is committing copyright infringement by making an unauthorized copy of the work, or perhaps even a derivative work? Displaying the image, then, as in the news, leads to the same result. Since the tattoo is part of Mike Tyson’s skin and face, then when Tyson is acting and his face is engaging in expressions, delivery of dialogue, and such, can it be argued that the tattoo is engaging in a “performance?” Remote, but then so is this whole topic. I also credit another legal commentator for pointing out that human organs generally are not subject to intellectual property ownership. The skin is an organ. While the tattoo and ink are not organs, once permanently embedded in the skin, they would seem to be part of that organ. I’ll let you take a shot at piecing an argument together based on that interesting line of thought. To the extent that the tattoo artist could construct a copyright claim in response to at least certain activities, it seems clear to me that this particular form of intellectual property would also be subject to considerable fair use exceptions. Some of the above points exemplify why. Just to further complicate things, I’ll mention that the tattoo is so closely and unequivocally associated with Mike Tyson that the tattoo might actually raise potential Right of Publicity considerations. Those issues don’t exist in the Hangover matter because Tyson obviously consented to appear in the film. But hypothetically, I can envision a scenario where that tattoo design on a person’s face, let’s say appearing in an advertisement of some kind, could constitute a violation of Mike Tyson’s Right of Publicity. In this regard, the claim might be even stronger than the copyright claim concerning Hangover II. In the latest entry of intellectual property owners suing video game manufacturers, the band No Doubt filed a lawsuit against Activision earlier this month. The suit is based on the band’s objection to the use of the band members as avatars which game users can use to perform songs other than the band’s own material. The suit specifically references the possibility of the band’s front person, Gwen Stefani, being made to perform the Rolling Stones’ Honky Tonk Woman, the lyrics of which reportedly are offensive to Stefani. Regular readers of http://www.rightofpublicity.com may recall the suit filed by Courtney Love against Activision, over the potential use of Kurt Cobain being made to perform music that Cobain would have objected to on artistic grounds. An interesting twist to the No Doubt case is that the band had a contract with Activision for certain uses of the band and its music. Apparently the dispute, then, is about the other uses a game player can make of the No Doubt characters. Questions that the lawsuit will surely tackle include whether the use by Activision constitutes a breach of contract, and whether the use may somehow be defensible as a fair use or other non-infringing use of the No Doubt band members. Recent draft right of publicity legislation reflects the video game industry’s lobbying efforts to make disputes such as the No Doubt lawsuit a thing of the past. In an effort to align video games with other statutorily-exempted uses, the lobbyists for the video game industry would like video games to be considered a protected medium and not subject to liability for right of publicity claims.